Texas Roadhouse Rolls is one of my favorite rolls to get when you go out to this restaurant. These rolls are sweet, hot, and you can slather them with the cinnamon honey butter. You can make these at home, and they are pretty easy to do. I don’t know why it is, but hot bread served just about anywhere makes going out to eat a real treat. I think the Texas Roadhouse menu has many tasty items on it. They are known for their yeast rolls they are some of the best rolls around. These are light, fluffy, and they just have the right amount of sweet to make them nothing short of amazing. I think you can have great results for you when you make them at home.
. I think this yeast really helps to improve the flavor of the final result. Regular bread yeast works well, but the gold instant yeast allows the sweet flavors to really peak out and this can really enhance the flavor of this rolls. What I like about this recipe is that it is an easy recipe to prepare. If you wanted to could have your bread machine stir everything together, it could knead it, and rise inside of there, but then you can remove the dough and then cut the dough and bake it in the oven. Even if you have never made rolls from scratch anymore, this is an easy recipe to prepare, and once you make bread from scratch I promise, you will want to do it again and again. 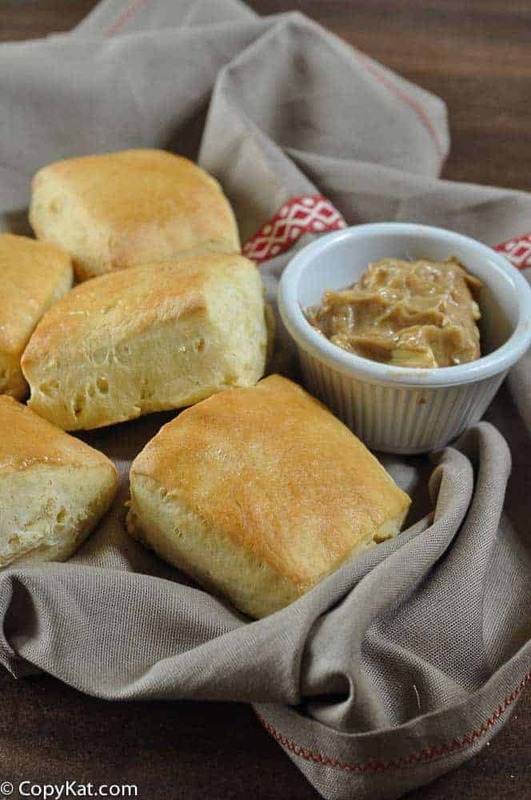 I like to serve this with the honey cinnamon butter, but plain butter is also good to serve with these rolls. Now you can make this recipe at home. This post contains an affiliate link with Amazon.com. I may earn a commission if you make a purchase from the link. You can make rolls that taste like Texas Roadhouse Rolls. In a cup or small bowl, stir together the warm milk, sugar, and yeast. Allow the yeast to proof and begin to activate while you prepare the other ingredients. (This is not necessary, but I prefer this to use milk cold out of the refrigerator). Using a stand mixer or food processor, combine the flour, egg, 1/3 cup melted butter, and salt. Add the milk mixture and process until you have a smooth dough; it will be stickier and wetter than regular bread dough. Place the dough in a greased bowl, turn the dough to grease all sides, and cover with a towel. Let rise until it has doubled in size. When the dough has doubled, punch it down and turn it out on a floured board. Let rest for 10 minutes. Roll out the dough into a large, flat rectangle approximately 1/2 inch thick. Cut into 16 portions with a sharp knife and place on a greased baking sheet and let rise again, until doubled. Preheat oven to 375 degrees. Bake the rolls for 10 minutes on the greased baking sheet. They will be light brown when removed from the oven. If desired you can brush the tops of the rolls with the remaining 1/4 cup melted the butter before serving. Prepare honey cinnamon butter by combining butter, cinnamon, honey, and powdered sugar with a mixer until well blended. There is no butter or eggs in the recipe for the Texas Roadhouse rolls !! I just called the restaurant and asked the baker. Wanna share? ??????? ?I heard they add honey to the bread dough, is that T or F? Any info would be much appreciated! How well does the dough freeze? My husband wants this recipe done as loaf bread and I have made the rolls before so would I need to make any major changes in order to have done as loaf? I just figure better to ask before I do it. Thank you. Thanks for your reply! I used to be a sou chef in a private oil club, and we had a baker there too. I kinda remember him doing that too. Just wanted to check with someone first as it was for Thanksgiving and I have never made rolls from scratch like that. Please don’t have refrigerator envy. We just moved and had not fully stocked the fridge yet. However it is a pretty good size, I couldn’t get them in there now. Also had a huge bucket in there as we brined our turkey in there too. Gonna have trouble getting in that Christmas Cheesecake!!! Oh my goodness, these are awesome. So simple and fast to make. I substituted one cup of whole wheat flour and it came out good. A little more body but not too heavy. Do you have any refrigerator sour dough roll recipes? My grandmother used to make some and keep the dough in the fridge and just pinch off what ever she needed for that nights dinner. Thank you again it was a great post. Can the Texas Roadhouse Rolls be made the day before, put in the refrigerator and baked the next day? Want to make for Thanksgiving but don’t want to mess with them the day of Thanksgiving. To be able to take out of fridge and pop into oven would be great! – (by this I mean a warmer) if not doing that- then just let them rise room temperature for an hour? Then bake as you would as you just made them. I am a baker at Texas Roadhouse and that recipe is NOT the recipe that is used at Texas Roadhouse! its very similar to our recipe but you added a couple things that we DO NOT use when we bake rolls. You are completely right, none of my recipes are actual restaurant recipes. I try to make them as close as possible for home cooks with ingredients they can find at the grocery store. I made these rolls today and though they did turn out just fine, they taste nothing like Texas Roadhouse rolls. Somewhat disappointed. Going to tweak it, and see if I can create a more closely flavored roll. Absolutely correct !! There is no butter or eggs in the recipe for these rolls !! What is the real recipe then? Made these tonight. Thank you for the recipe. So easy and my family loved them. Great taste but had to leave them in 375 oven for 25 mins to even get them lightly brown on top, then the bottoms were a little too dark and the rolls were a little hard, They would have been under baked if I took them out before that. They really didnt rise that well even though I used fresh Red Star Platinum instant yeast. Any suggestions to get them more light and fluffy? I don’t know what happened, but it sounds like the yeast didn’t do enough to help the dough rise. You could have let the dough go for a little longer, and let it raise a little more. I am sorry this didn’t work out well for you. I often use parchment paper to bake with… i don’t like hard/dark bottoms on my bread. If I have to prep this in big batches, should I double/triple the amount of the yeast? Or, should I stick with the amount of the yeast, while the rest of the ingredients are doubled/tripled? I would add more yeast, in proportion to the rest of the ingredients. So if you are going to double the recipe, be sure to double the yeast. IC. Thank you so much for your prompt reply. Tried this the other day, it was a big success. I was just wondering why do the biscuits taste like they have honey in them!? Don’t get me wrong, I LOVE THEM BISCUITS!! THANK YOU!! I can’t taste honey, but I can taste they are sweet. I have added some sugar to the yeast dough to account for these tasting sweet. Tried your recipe before and was wonderful. will tryagain thanks again . I am very glad you enjoyed the recipe. One way to get warmth for the rising of dough is to dampen a couple of towels, toss them in the dryer, turn the dryer on and leave the dough on top of the dryer. That always works like a charm for me in Northern Europe, where truly warm days are relatively uncommon. That’s a great idea 😉 I don’t know why I don’t make more refrigerator rolls. I broke this recipe. 🙁 I have tried three times now and I cannot get a rise from the dough. Very tasty but a bit flattish. Any suggestions? I always try to give a plug for fresh cake “wet” yeast that was once the only kind you could get. Now, since no one knows it exists, the instant and granulated dry yeast is ubiquitous and everywhere. Once you’ve found Fleishmans cake yeast in little foil wrapped squares sold in the dairy refrigerated section in some stores (Weismarket in Carrol County in Maryland, Harris Teeter, Wegman’s used to, most stores “used to”) you won’t want to go back to dry yeast. If dry yeast even slightly over-proofs, it smells and tastes like mothballs once it’s baked. The reason the stores stopped carrying the fresh yeast was financially motivated. The stuff is perishable and has a real shelf life, not two years like the dry. They had to throw out what didn’t sell, rather than try to promote it. I buy it in the 2 ounce blocks and keep it for two months, carefully wrapped in the little butter compartment on the fridge door. I just hope someone will read this and try and locate the fresh product. The smell is heavenly. What can i do to make these gluten free? Should i substitute flour with King Arther flour and gluten free milk.? Also, could i use a round cookie cutter instead of cutting them into squares? I think this would need a lot of modifications. Perhaps cup for cup flour would work. This is a brand of flour. You can use a round cutter. I think milk is naturally gluten free. Did you need this recipe to be dairy free as well? Any suggestions on how to store them? And reheat them? I’m going to attempt this recipe for tomorrow. I have two challenges. 1) I’m at 5200 ft, 2) I’ll be under time constraints so I need to know it’s ready on time and not early or late. Oh, and I’ve never made bread. I’m not sure which high altitude adjustments I should make and am afraid it’ll rise too much too fast if I don’t adjust the yeast. I’m hoping I get a reply today, but I think I better just make a batch now to try to work out the major kinks for tomorrow’s real thing. Here is what I found on the Philbursy website. I can’t test this out because I am at darn near sea level. Good luck my friend! At high altitudes, flours tend to be drier and therefore may absorb more liquid. If dough seems dry, add more liquid and reduce the amount of flour the next time you make the recipe. Yeast breads will require a shorter rising time and should rise only until double in size to prevent them from collapsing during baking. Allow unshaped dough to rise according to recipe directions; punch dough down. Repeat rising step once more before shaping dough.